Rad Nah is comfort food for me. I guess it is the warm gravy and the soft noodles. A good rad nah has tender pork with soft chewy noodles and plenty of gravy. You can substitute any meats, tofu or seafood for the pork or omit it altogether. If you omit it, you won't miss much. 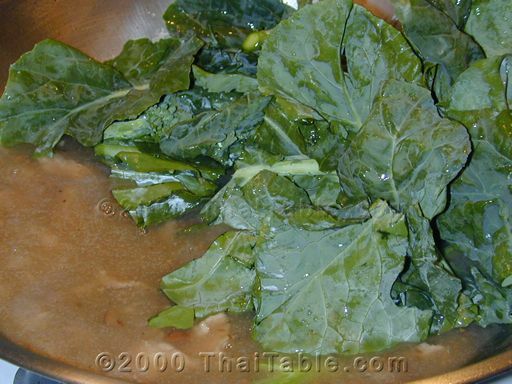 If you can't find Chinese broccoli, try collard greens, broccoli, or kohl rabi. Good Rad Nah has really tender pork and part of the trick for the tenderest pork is coating it in tapioca flour before cooking it. Coat the pork with 1 tablespoon of tapioca flour. 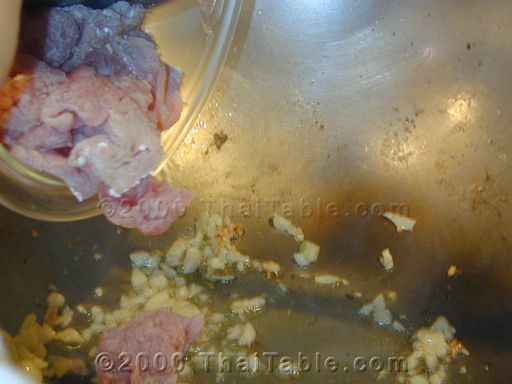 Mince garlic. In a bowl, add water to the rest of flour. This will be the base for sauce. 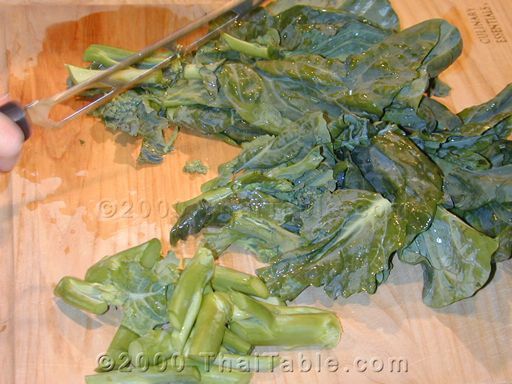 Cut up the Chinese broccoli into 2 inch-pieces. Slice the noodles into 1/2 to 1 inch wide strips. Break the clumped noodles into strands. You can either heat up the noodles in a non-stick pan or in the microwave. Cooking it in the microwave loses a little of the texture, but is easier. Part of what I like about rad nah is that some noodles get a little crunchy and some are still soft. But when you cook it in the microwave, you don't get the crunchies. If you Microwave: Put the separated noodles and 2 tablespoons of dark soy sauce in a microwaveable bowl and mix well. Then microwave it for 3 minutes or until soft. Otherwise: Non-stick pan: Heat up 4 tablespoons of oil in a non-stick pan. You really want a non stick pan, believe me. I use cast iron pan. When the oil is ready, put in the noodles and stir. Add 2 tablespoons of dark soy sauce on the noodles. The purpose here is to heat up the noodles and add some color. Stir again until all the noodles are broken into pieces. Don't worry if they are cut into small pieces. Keep stirring for 5 more minutes. 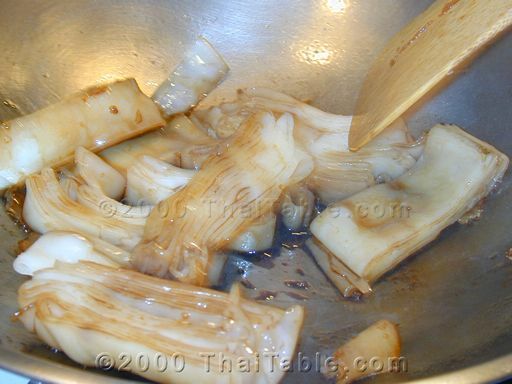 Remove from heat and set the cooked noodles aside. Cooking The Meat and Gravy: In a pot or pan that is big enough to hold all the ingredients, heat up the rest of the oil. Add minced garlic and pork. Stir for a minute or so until the pork is getting cooked. Add the flour water. Stir quickly to keep it from forming chunks. 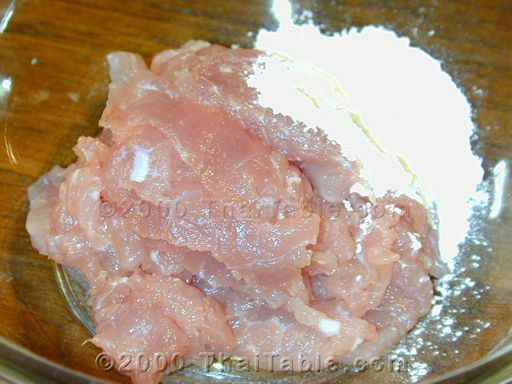 When cooked, the flour will turn from white to clear. Add soy sauce, yellow bean sauce and sugar. Stir. 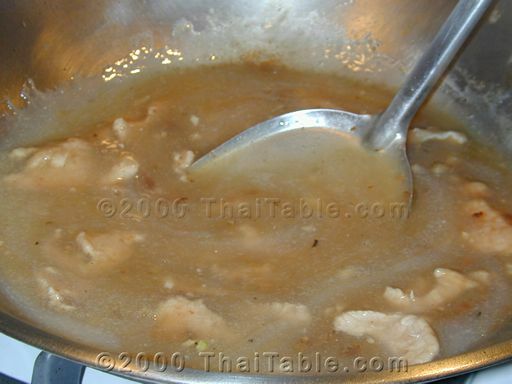 When the sauce is bubbling, it should have a consistency of thick gravy. And if the sauce is not thick enough, add more flour water. If you like thin sauce, add more water. When you add water, adjust the sugar, soy sauce. 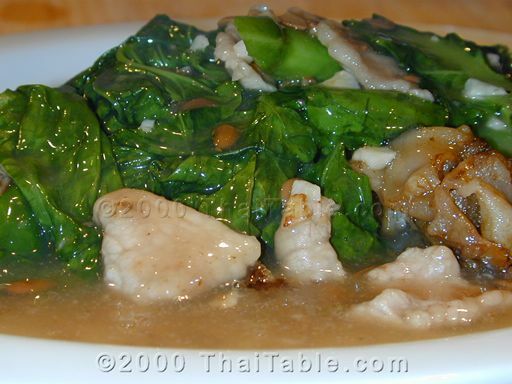 Remember, Thai food is trial and error, so it is time to taste. If you need more soy sauce, add some. When you are done with tasting, add Chinese broccoli. Stir quickly and turn the heat off. Don't let the greens cook for too long, or they will turn brown and won't be crunchy. Put noodles on plates and top with the gravy. Sprinkle some ground white or black pepper. Serve hot. In Thailand, Rad Nah is served with sugar, fish sauce, peppers pickled in white vinegar and ground chili pepper for your personal taste. The addition of vinegar with peppers adds a lot of dynamics to the final flavor. You can make your own vinegar with pepper. Slice any type of green chili pepper that is not hot; do not use the real little ones. 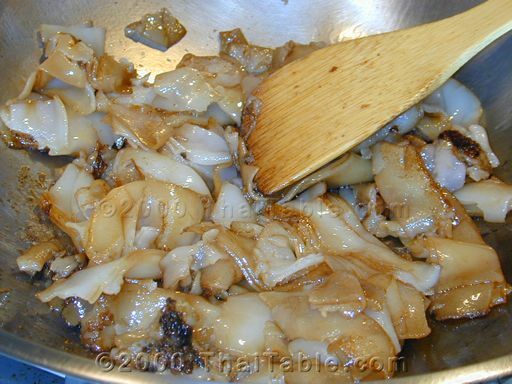 Just pour vinegar over and let it sit for few minutes or days.